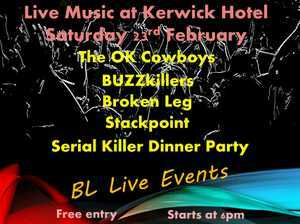 BL Live Events are holding a live music event at Kerwick Hotel featuring Stackpoint, The OK Cowboys, BUZZkiller, Broken Leg and Serial Killer Dinner Party. This free event is open to all ages if they are supervised by an accompanying adult. Come and check out Brisbane's best and upcoming independent original bands including Stackpoint, The OK Cowboys, BUZZkillers, Broken Leg and Serial Killer Dinner Party. BL Live Events are bringing live music back to the suburbs.